Every fall, the National Milk Producers Federation organizes a joint annual meeting with the National Dairy Promotion and Research Board (NDB) and the United Dairy Industry Association (UDIA). Dairy producers, member cooperatives, Young Cooperators (YCs), industry representatives, staff and others from all over the country arrive for three days of speeches, reports, banquets, general sessions, town hall meetings and award ceremonies. Taking place in a different U.S. city each year, the annual meeting represents an opportunity for those active in the dairy industry to get together and share in their common accomplishments and challenges, as well as discuss the best route for the industry’s future. Thank you for attending the fall’s most anticipated dairy industry event: The 2018 NMPF/NDB/UDIA Joint Annual Meeting. This year’s conference was held from October 29-31 in Phoenix, Arizona, at the JW Marriott Desert Ridge. 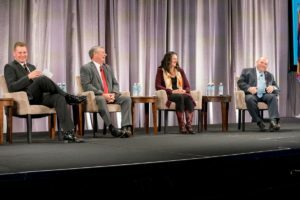 Featuring presentations, panels, the Dairy Bar and more, this year’s event centered on shaping a brighter future for the U.S. dairy industry. Congratulations to Tillamook County Creamery Association for winning the Best Overall prize at the 2018 NMPF Cheese Contest! See the rest of the results (and the winning team) here.